Much of Charlevoix's rich history is preserved by the Charlevoix Historical Society through its two museums, The Harsha House and the Charlevoix Depot Museum. The Harsha House was built in 1891 by Charlevoix businessman Horace Harsha and was the family home. Harsha's daughter, Irene, married Earl Young, the Charlevoix architect know for his "mushroom" hobbit houses. The Queen Anne style home was donated to the Historical Society by his granddaughter, Ann Harsha in 1979. The museum has three Victorian period rooms to view, the 3 1/2 order fresnel lens that was on the Grays Reef Lighthouse, Ernest Hemingway's original license for his marriage to Hadley Richardson, a working 1917 player piano and other local historical artifacts. Also at the Harsha House are more than 9,000 historical photos, slides and negatives and history research materials. The museum is open Thursday-Saturday during March and April, Tuesday-Saturday during May and June and September-January, and Monday-Saturday during July and August. 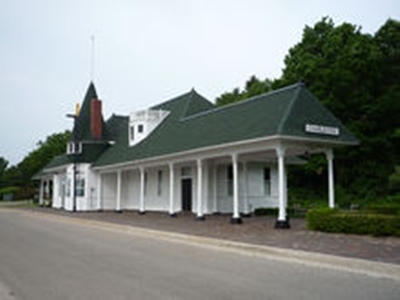 The Charlevoix Depot Museum was given to the Historical Society in June 1992, the 100th anniversary of the first train to arrive at the depot, by the Robert Pew family. The depot has been restored and is used by the Historical Society for a variety of events.